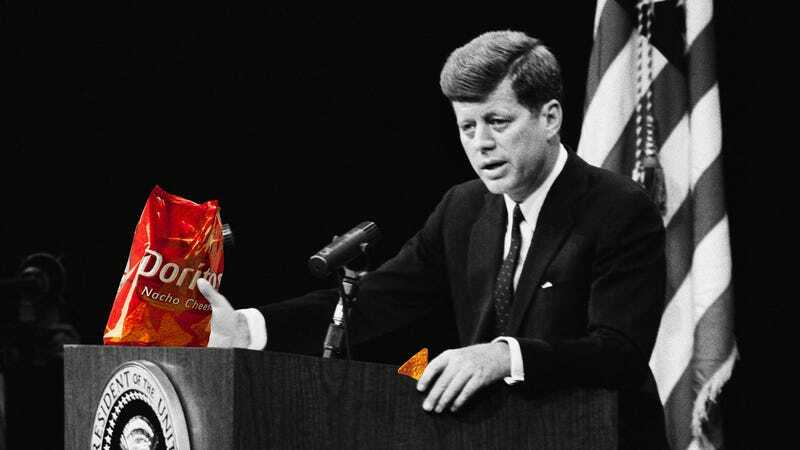 When You Can Make 'JFK' Say Anything, What's Stopping Him From Selling Doritos? On Friday, The Times of London teamed up with a tech company and a creative agency to digitally recreate “the speech JFK would have made in Dallas had he not been assassinated.” The Dallas Trade Mart speech never happened—Kennedy was killed the day he was supposed to deliver it—but thanks to artificial intelligence, you can now listen to “JFK” give the 22-minute speech in his own voice. As posthumous recreations like this become more common, however, some thorny legal and ethical questions arise. For instance, what is stopping ad companies from making late presidents and deceased celebrities (known in the entertainment industry as “delebs”) say anything they want? How Hard Are These Recreations to Make? ROTHCO and Cereproc were responsible for the technical aspects of the Kennedy recreation. According to a press release, the companies reviewed over 800 analog recordings of Kennedy giving speeches and interviews. 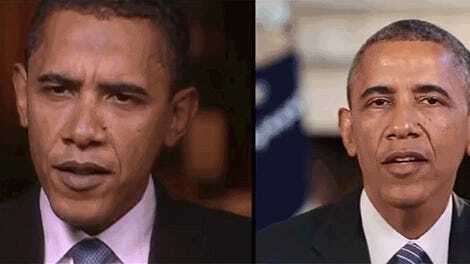 A deep neural network was fed the dataset, creating a model based on the late president’s speech patterns. After isolating individual sound units (known as phonemes) from the recordings, the companies then used the neural network to choose the best examples to stitch together. There were a number of other technical and manual processes involved, but those are the key steps. According to The Times, the project took about two months. This certainly isn’t the first time a company has leaned on digital tools to recreate icons that are no longer with us. Using tech like CGI, voice- and face-mapping, and holograms, celebrities like Prince, Carrie Fisher, Tupac, and Oliver Reed have all seemingly been brought back from the dead. And as we’ve seen with the rise of so-called “deepfakes,” it no longer takes major movie funding to do so: almost anyone can now make a digital mask of the dead. With the technical barriers to posthumous recreations lower than ever, the primary constraint (other than public backlash) is the law. Even if you’re a public figure, your face and voice isn’t up for grabs for anyone to profit off of, but protections vary by state. Less than half of the states in the US have an established “right of publicity,” which gives individuals the right to control the commercial use of their likenesses. Similar to property rights, under the right of publicity, you can assign, license, or sometimes bequeath your likeness. This is an issue that existed long before holograms and deepfakes. The most prominent right of publicity cases have involved celebrities whose likenesses were used in an unauthorized commercial context using impersonators. In 1990, for example, Back to the Future actor Crispin Glover sued Universal Pictures after the film studio tried to recreate his character’s face in Back to the Future II by casting another actor wearing prosthetics. That suit was ultimately settled out of court, but both Bette Midler and Tom Waits won similar cases against companies (Ford and Doritos, respectively) that used celebrity soundalikes in their commercials. The right of publicity applies to living people, but in some states, it extends posthumously. If that’s the case, then you can pass down your face and voice to your estate when you die, much like you would with property. What Happens to Your Face When You Die? As state laws vary, your face (or voice, or entire likeness) has different protections depending on where you legally reside when you die. If your state has strong posthumous publicity protections, it might be passed down to your heirs. If not, how your likeness is capitalized on is more of a free for all. This was a disputed issue following Marilyn Monroe’s death: The actress’ estate claimed that Monroe was domiciled in California in an attempt to invoke the state’s right of publicity statute. It was denied, as her legal residence was determined to be in New York. Even without right of publicity, there are other protections you could posthumously rely on to keep your digital doppelgänger out of commercials. Your estate could argue that using your likeness without permission is false light publicity, defamation, or an invasion of privacy, Rothberg noted. If, for instance, someone made “a fake AI that says, ‘I’m so-and-so and I support gun control’” and it damaged your reputation, your estate might have a defamation case. In the event that someone made a fake video or audio of you that doesn’t necessarily hurt your reputation, your estate could still argue that it’s false light, that is, portraying you in a misleading way that is deeply offensive or embarrassing. What’s Stopping My Heirs From Selling My Face When I’m Dead? “I mean obviously Disney’s not going to release the contract, what it’s worth to resurrect an actor after they’re dead,” said Rothberg, referring to both Fisher and Cushing’s CGI stand-ins. “You’d have to imagine that they cut some deal with the family so that they would allow them to use that.” That’s unless the studio already owned a license of their likeness for future Star Wars films after they died. Rothberg noted that that is how general contract law works—your right to publicity, like a property right, can be sold and licensed, even after you are dead. We don’t need to wait for the rise of CGI zombie spokespeople to see how this could go wrong. When Ram used a sermon by Martin Luther King Jr. to sell trucks during a Super Bowl ad, there was an immediate backlash. While the non-profit King Center distanced itself from the ad, it soon became clear that the licensor of King’s estate, headed by King’s son Dexter King, approved the commercial. While the law appears to have worked as intended, the results were disconcerting, to say the least. So even if you live in a state with a firmly established posthumous right of publicity, I hope you trust your surviving heirs. If they value a licensing fee more than your reputation, they can hand over your face, voice, and anything else to the highest bidder.